Applications: Lap mops are perfect for blending, graining and re-finishing on curved and complex shapes where a lot of flexibility is required. They are usually used on tapered spindle machines such as those used for polishing mops. Product Notes: The most common grade used is the Medium A (MA) for blending a typical 240 grit satin finish on stainless steel. Finer grades, such as Fine A (FA) and Very Fine A (VFA) are used more commonly on softer metals, such as aluminium. Coarse grades are more aggressive and will clean coatings. Super-cut (SC) is a high performance, durable grade, suitable for stainless and harder materials. The range below is normally in stock. We may be able to supply different grade and lap combinations - please enquire. Lap mops are made from non-woven abrasive material which is flexible and open-structured to resist loading. It contains abrasive grain of varying grade, suspended within a non-woven fleece type base, fixed with resin. Stocked and sold in packs of 5 (except 250mm dia). 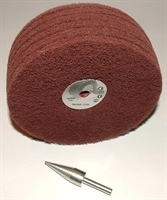 Also Available: We stock a range of polishing mop wheels. For more aggressive cleaning & stripping we stock stripping wheels that will mount to tapered shafts.